Getting ready for the opening “Kanpai!” on the first day of Shochu Street. spirits, all of which involve some volume of drinking and revelry. Tokyo hosts a event that gets a little better every year. But if you want to find the best parties, then you’d better head south. Kagoshima Prefecture has more than 100 shochu distilleries, the most per capita anywhere on the planet. So it’s no coincidence that Kagoshima City hosts the crown jewel of Shochu Day celebrations, Shochu Street. This year’s event was again held in the Tenmonkan shopping arcade. The wide pedestrian walkways are perfect for the long tents that get set up in the center in an extended T-shape. 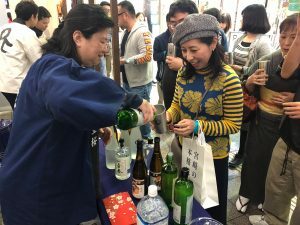 113 distilleries were represented at 2018’s Shochu Day celebration, a party that continues for three days! There were dozens of shinshu to try. Shinshu is early season shochu that has not been aged, and it is appreciated for having more robust aroma and flavor profiles. Guests can buy a card with five drink tokens which costs ￥500 (roughly 88 cents per drink), and then roam the arcade sampling drinks from the prefecture’s six regions. There was of course a long line for the limited supply of Moriizo, but lesser known stars of the industry also saw their stash poured out to thirsty guests in a hurry. 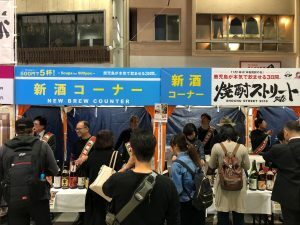 The distilleries themselves took turns over the three days staffing the region-themed tents as the stage was constantly kept alive by a revolving door of famous Kagoshima-based personalities and celebrities from the shochu industry. This is an absolutely fantastic time to visit Kagoshima City because Shochu Street generally overlaps with the equally festive and enjoyable Ohara Festival which shuts down the main road adjacent to the shopping arcade. The first outdoor Nonjoruno was held in Miyazaki City on November 3rd. Furusawa-san pours her distillery’s shochu for a lucky guest. Nonjoruno tasting event which was held outside for the first time on November 3rd. 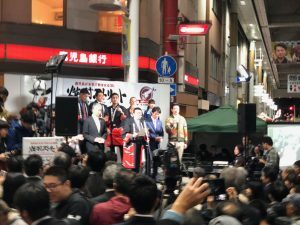 Despite being held in a similar format to Shochu Street, Nonjoruno only had a limited number of tickets available, all of which were sold to the public on the day of the event. The 2,000 people quick enough to buy an official Nonjoruno thermos cup could stroll the area and sample as many Miyazaki Honkaku Shochu brands as they liked. The longest line was probably at Kuroki Honten where their famous “Hyakunen no Kodoku” (100 Years of Solitude) brand was quickly drained. Other tents brought their shinshu (kind of a Beaujolais Nouveau concept), which we made sure to try both on the rocks and oyuwari. But don’t forget about Okinawa! We’re technically right at the end of Awamori Month, and the main event from November 1st-4th down in Japan’s southernmost prefecture have been supplemented by other events around the country. All 47 of Okinawa’s distilleries were represented at the four-day event billed as “Ryukyu Awamori no Sui in Zenikura” where the famous Awamori Soko guys ran the bar. So mark your calendar, November 2019 is definitely the time to visit Japan’s southern islands!